Topological phase of matter is fundamentally distinct from the usual quantum phases such as magnetism, superconductivity. A topological phase is defined by a glocal phase acquired by wavefunction as it traverses through a non-trivial parameter space (such as space, time, or momentum). Quantum Hall effects, magneto-electric efects are some of the widely studies examples of topological phases. An interesting feature of topological insulator is its guaranteed to be metallic on the boundary. Our group studies the topological phases by fundamental mathematical tools, in combination with low-energy modellings, tight-binding model, density-functional theory, quantum field theory, Chern-Simons theory. 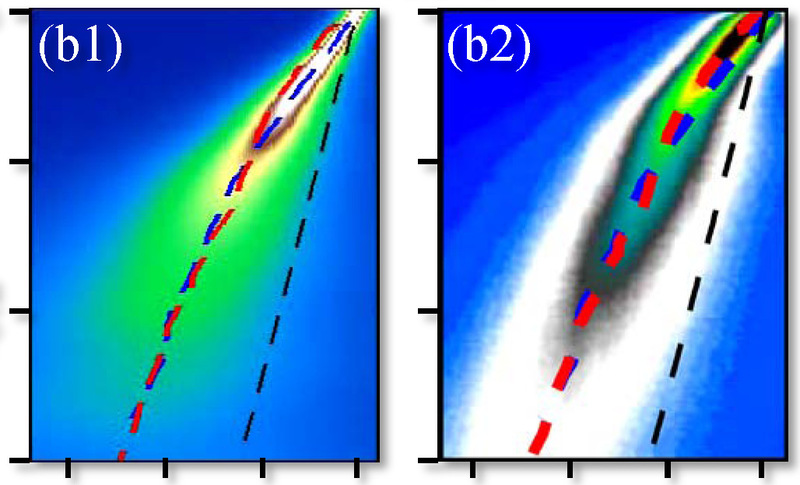 Some of the highlights of our group's contribution to this field are (a) Engineering topological insulator through different methods of chirality/helicity inversion, (b) competition between topological and quantum phases, (c) prediction of new topological insulators. 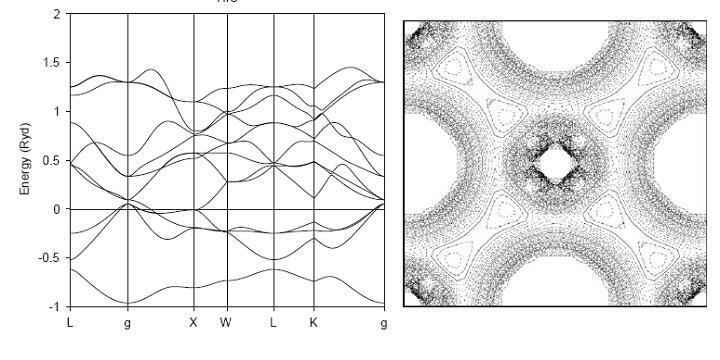 Nature Communications 4, 1972 (2013). Physical Review B 88, 035444 (2013). We propose that in systems where the non-interacting wavefunction is defined by exotic quantum number such as total angular momentum, pseudospin or helical quantum number owing to spin-orbit coupling of various natures, interaction can induce emergent spin-orbit density wave even when time-reversal symmetry remains intact. We apply this idea to the hidden-order state in URu2Si2, 2D electron gas, and for the metal-insulator transition in iridate systems. Interaction induced staggered spin-orbit order in two-dimensional electron gap. Phys. Rev. Lett. 109, 246406 (2012). The order parameter responsible for a second-order phase transition in heavy fermion URu2Si2 has remained a long-standing mystery. We show a spin-orbit density wave is responsible for this hidden order state. 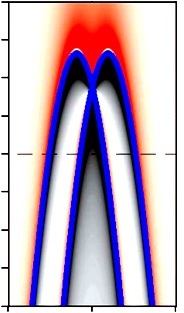 The staggered spin-orbit locked hidden-order gap is toologically protected from any time reversal invariant perturbation such as pressure, while magnetic field will destroy the order. Spin-orbit density wave induced hidden topological order in URu2Si2 Sci. Rep. 2, 596 (2012). Staggered spin-orbit: A new paradigm of broken symmetry phase of matter. J. Super. Nov. Mag (2012). 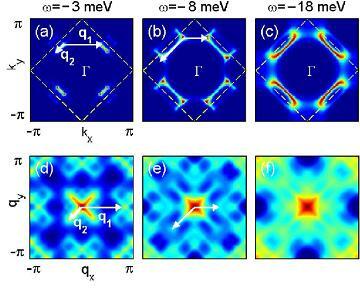 We argue that multiband superconductor with sign changing gaps may have multiple spin resonances. We theoretically show that the resonance spectra split both in energy and momenta due to the effects of multiband and multiple gaps in a s+--pairing. Phys. Rev. Lett. 106, 157004 (2011). 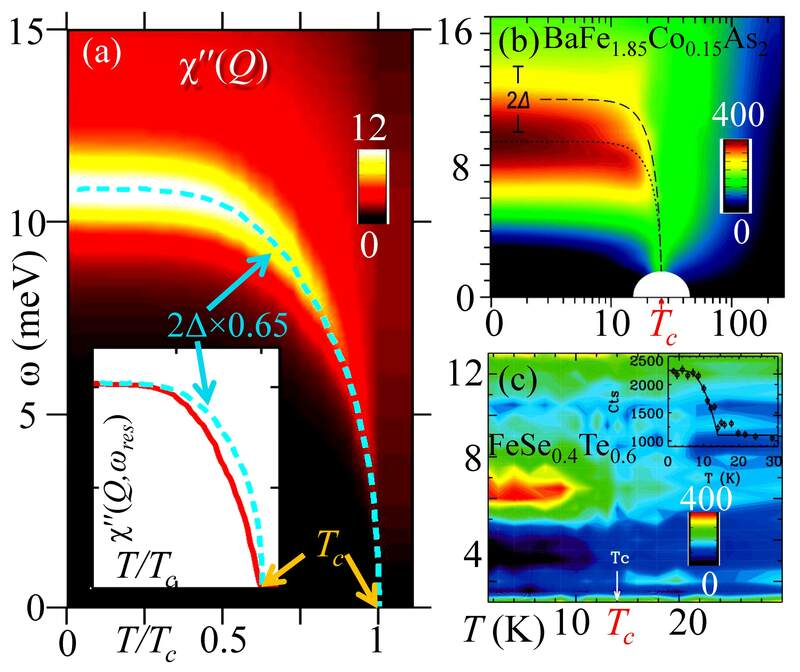 We argue that layered FeSe-based superconductors obtain nodeless and isotropic superconducting gap, coming from the inter-electron-pocket nesting. Our prediction of spin-resonance, as a menifestation of d-wave pairing, was realized later. Phys. Rev. B 84, 014521 (2011). Also see the mechanism of nodeless d-wave in cuprates. 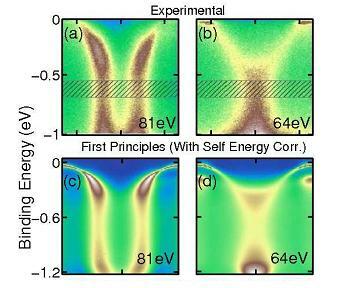 The nodeless pairing symmetry in Fe2Se2 superconductors breaks the translational symmetry. We argue that such pairing symmetry is possible if a normal state broken symmetry can compensate for the broken translational symmetry, which is Fe vacancy order. Recent observation pressure induced second superconducting phase in iron-selenides calls for the models of superconductivity that are rich enough to allow for multiple superconducting phases. We suggest the phase assignment where high-pressure introduced new electronic states on the Fermi level which allows to develop a s+- where the phase at low pressure is nodeless d-wave. 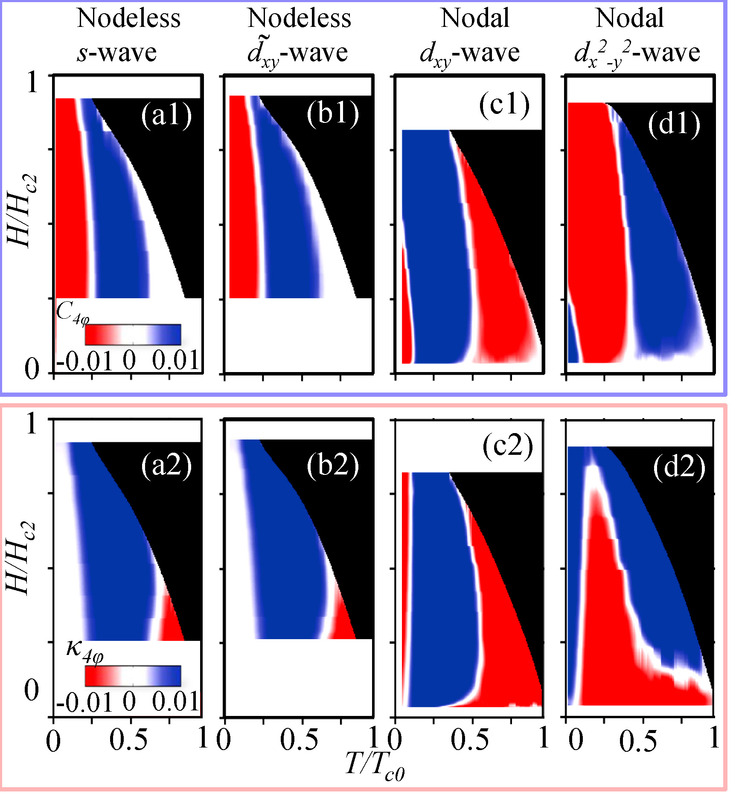 An effective technique for measuring the bulk pairing symmetry anisotropy is probing the oscillation in thermodynamic properties in a rotating magnetic field. 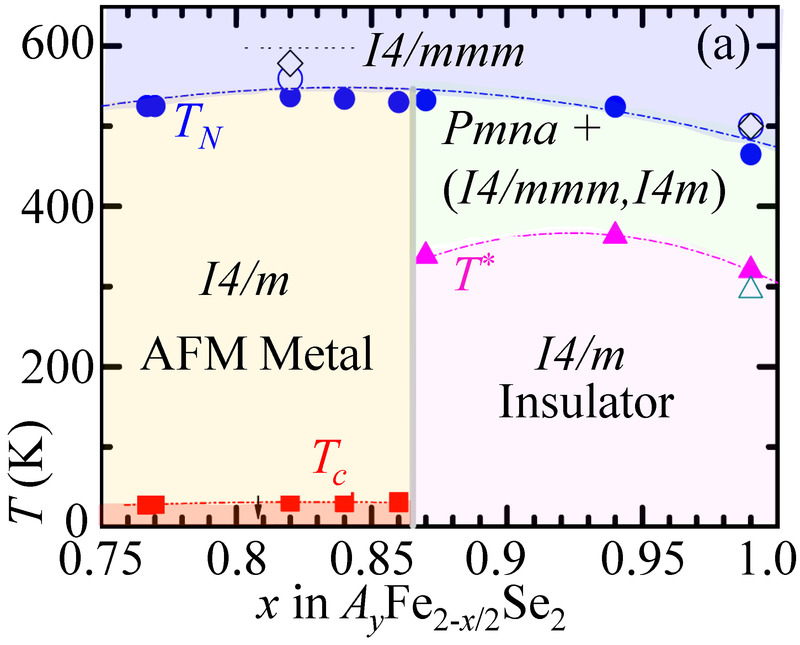 We show for the first-time that oscillation and gap anisotropy does not always have an one-to-one correspondence when the Fermi surface anisotropy is strong, as in iron-selenide superconductors. Phys. Rev. Letts. 109, 187006 (2012). 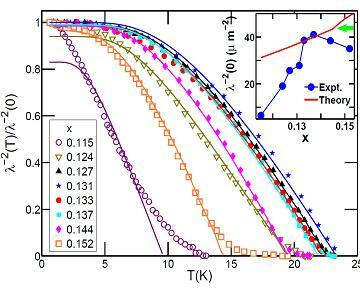 We have introduced and demonstrated that cuprate superconductors reside in the intermediate coupling regime, where the effective U value is of the order of the bandwidth. The model we call is quasiparticle-GW or QP-GW model, which successfully describes photoemission, tunneling, optical, x-ray, RIXS, Neutron and other experiments. Markiewicz, J. Elec. Spec. Rel. Phenom. 181, 23 (2010). 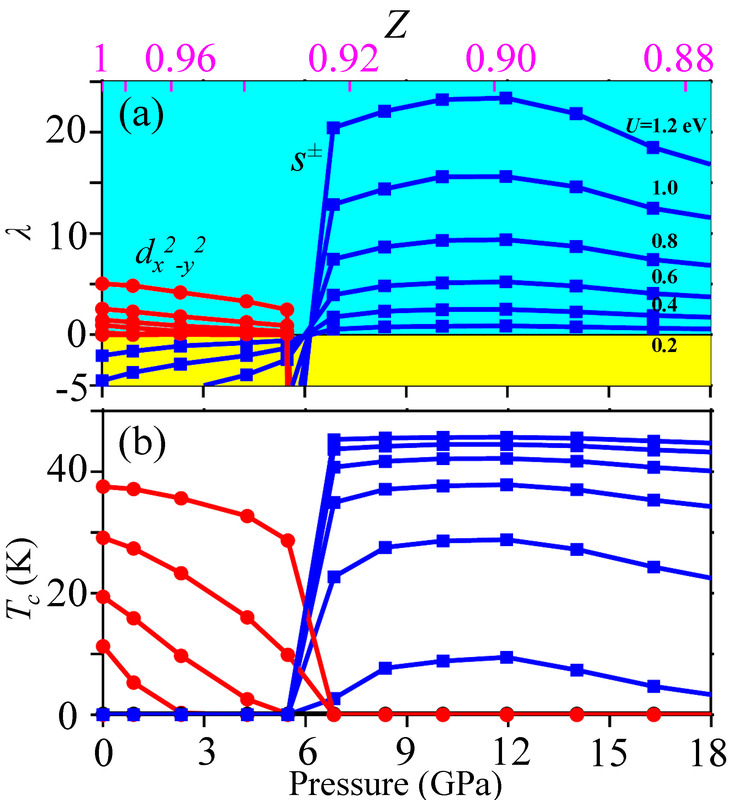 Optical model-solution to the competition between a pseudogap phase and a Mott-gap phase in high-temperature cuprate superconductors,Phy. Rev. B 81, 174504 (2010). 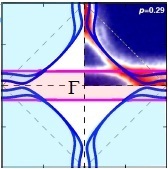 Emergent non-Fermi-liquid behavior due to Fermi surface reconstruction in the underdoped cuprate superconductors, Phys. Rev. B 81, 184515 (2010). Failure of t-J models in describing doping evolution of spectral weight in x-ray scattering, optical and photoemission spectra of the cuprates, Phys. Rev. B 82, 224501 (2010). 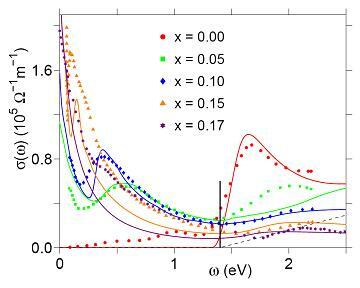 X-ray absorption near-edge spectra of overdoped La2-xSrxCuO4 high-Tc superconductors ,Phys. Rev. B 83, 115117 (2011). Coexisting pseudogap, charge-transfer-gap, and Mott-gap energy scales in the resonant inelastic x-ray scattering spectra of electron-doped cuprate superconductors,Phys. Rev. B 85, 075104 (2012). We have shown here that the despite the presence of a nodal dx2-y2 pairing gap in the underlying spectrum, electron-doped cuprates behave like nodeless d-wave in the underdoped region, due to the coexistence of antiferromagnetism and superconductivity, openning a magnetic gap at the nodal region. Phys. Rev. Lett. 98, 197004 (2007). J. Phy. Chem. Sol. 69, 2963 (2008). Via optical absorption calculation, we show that cuprates host two energy scales: (1) Mott gap state in the UV scale which persists at all doping (2) Mid-infrared feature origination from pseudogap opening in the underdoped region. Results are consistent with RIXS and spectra also. Phys. Rev. B 81, 174504 (2010). Europhys. Lett. 96 27004 (2011). Phys. Rev. B 85, 075104 (2012). 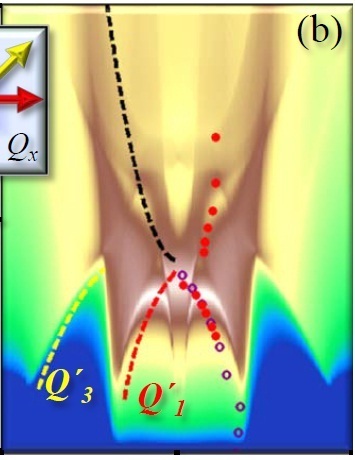 We show that the anomalous lineshape and dispersion renormalization in cuprates or the so called 'waterfall' phenomena arises from strong electron-electron correlation effect such as spin-fluctuation mechanism within the intermediate coupling limit. Phys. Rev. B 80, 214520 (2009). J Phys. Chem. Sol. 72, 341 (2010). 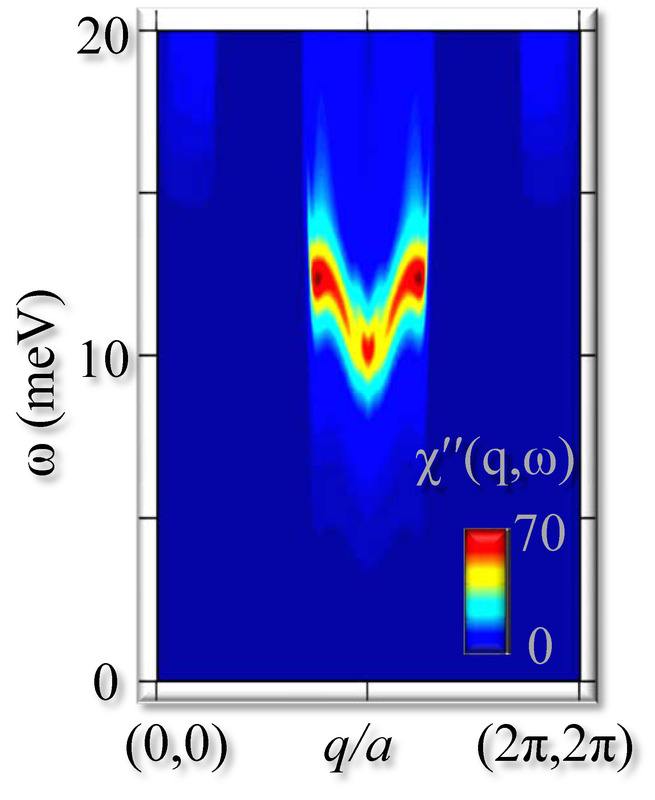 We show that the spin excitation spectrum in the superconducting state originates from Bogoliubov quasiparticle scattering associated with Fermi surface nesting and gap out the normal state spin-wave dispersion. These two oppositely dispersive spin-excitation spectra meet at an energy and momentum to give rise to the so called `hour-glass' feature. Phys. Rev. B 85, 064510 (2012). Phys. Rev. B 85, 224535 (2012). Phys. Rev. B 86, 054518 (2012). Phys. Rev. B 85, 144510 (2012). We also show that the crossover from superconducting scattering to the spin-wave spectra, which generates `hour-glass' phenomena, also manifests into a low-energy kink in the electronic spectra. Phys. Rev. B 85, 144526 (2012). We demonstrate that the Cu-O chain state in YBCO cuprates is electron-like, which essentially explain negative Hall-effect, in-plane anisotropy in many spectroscopies. Can a open-loop chain state give rise to quantum oscillations? Phys. Rev. B 86, 064527 (2012). We find that in addition to the common CuO2 band, a hybridized Hg-O state is present in the vicinity of the Fermi level in Hg-based cuprates, which yields a collective mode in the multiorbital channel arises at Q=0. 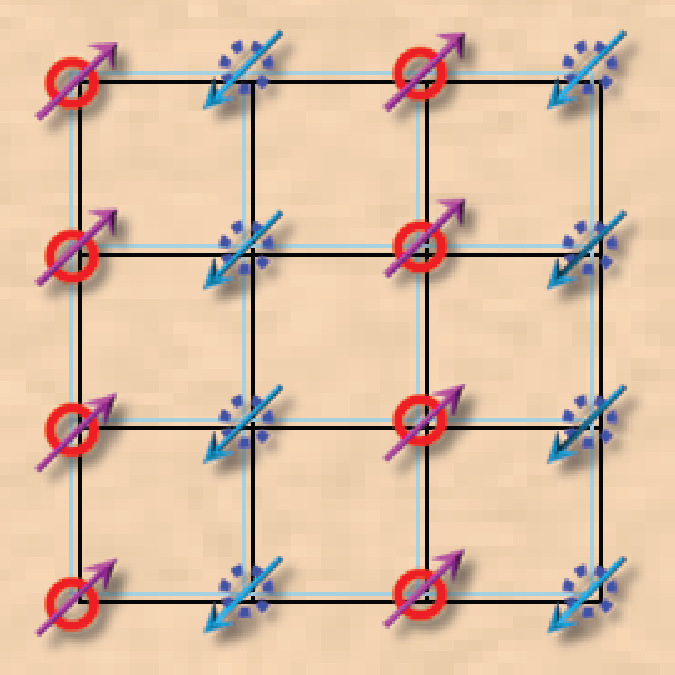 This calculation suggest that the this mode has nothing to do with the pseudogap physics. We show that the single-particle spectra of cuprates consistently exhibit two-gap behavior, coming from the normal state residual ansiferromagnetism and d-wave superconductivity. The coexisting antiferromagnetism and superconductivity model explains numerous salient ARPES, STM and other spectroscpies in both electron and hole-doped cuprates. Phys. Rev. B 74, 020506(R) (2006). Phys. Rev. B 77, 134516 (2008). We show that the spin-orbit coupling split 5f-states lead to a strong spin-fluctuation peak in a large class of actinide materials. These fluctuations couple to the single-particle spectrum and give rise to a similar waterfall physics, and peak-dip-hump feature as in cuprates. Our calculations motivated experimental findings of the same features. Phys. Rev. Lett. 108, 017001 (2012). Phys. Rev. X 2, 041012 (2012). A review article coming up in J. Mat. Res. (2012). We calculate spatial superfluid density variation for PuCoGa5 superconductors within the Swiss Cheese model in the presence of disorder. We find that a one-to-one correspondence between the local maps of the density of states, superconducting order parameter, and superfluid density exists. Phys. Rev. B 84, 134510 (2011). We calculate the electronic local density of states (LDOS) of DNA nucleotide bases, deposited on graphene. We observe significant base-dependent features in the LDOS in an energy range within a few electronvolts of the Fermi level. These features can serve as electronic fingerprints for the identification of individual bases in scanning tunneling spectroscopy experiments. Electronic structure and elastic properties of transition metal and actinide carbides. We study the systematic of the electronic structures of the carbides of the transition metal series and the actinides U and Th using TB-LMTO code. For the actinide carbides, the f-states have features rather different from the 3d-5d transition metal carbides. Similar studies are made on these carbides. Physica B: Cond. Mat. 367, 6 (2005).